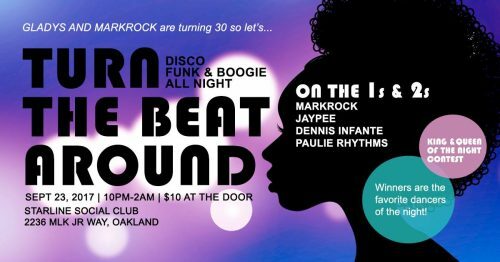 DJing at Starline Oakland in the downstairs room this Saturday for Gladys & Mark Rock’s Birthday. Happy to rock vinyl sets with my boys, Jaypee, Paulie Rhythms and the Birthday boy, Mark Rock. Come celebrate and dance w/us… and have a drink or two, I guess lol.